Women’s Health magazine teamed up with New Balance and Laura Dundovic for this intense 45 minute session. Laura Dundovic, the model and personal trainer, led a crew of 50 through the high intensity workout, and attendees were then refuelled with some breakfast courtesy of the Blue Room in Bondi. This was the second Celeb Sweats event this year. I've always wanted to shoot the Mardi Gras, and 2017 was the year it happened! Airbnb's float was electric with its energy, as the troop of dancers ripped up Oxford Street. Next year I'll be in to this again for sure. Airbnb's hashtag for the event was #weaccept. And we do. Well we should anyway. Getting your sweat on. 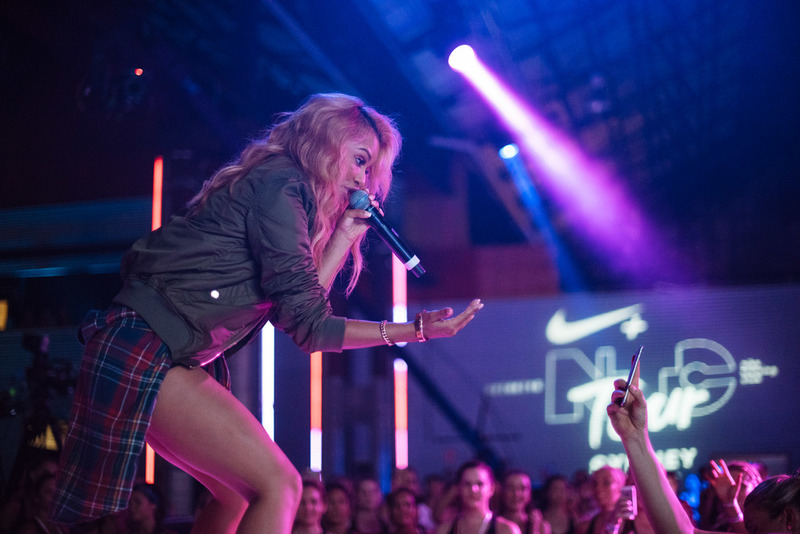 Nike NTC Tour Sydney. Former international cricketers Michael Vaughan and Brett Lee were on stage at the Rocks on Tuesday to talk all things cricket, just as NZ were taking on South Africa and Australia were preparing for their clash with India. Lee was talking up Australia's chances, complimenting their awesome pace-attack. Several cricket fans who had travelled from the sub-continent lapped up all the pre-game entertainment, including some traditional Indian dancing. ABC's Q&A program moved to the Big Top Amphitheatre at the Sydney Showground for its show on Monday night. The program was based around rural issues and The Big Top proved a great venue with a big crowd. Treasurer of the Royal Agricultural Society, Robyn Clubb featured as one of the panelists. Westfield Penrith hosted a range of activities to mark 'Fashion Saturday' at the centre. Roaming fashion parades, master classes, entertainers and spray painting for the kids were all part of the big day. We look forward to the next one! Performers from Sri Lanka and South Africa took to Martin Place on Monday to spruik the big quarter-final match up between the two countries on Wednesday at the Sydney Cricket Ground. Sri Lanka first played some traditional tunes and then an energetic set from Drum Circle Events tried to get the crowd dancing. Former Australian cricketer Mike Hussey was even lured in to the action! Read about my photo donations for GI Cancer.